The thirty-five year old Fernandes arrived in Honiara yesterday afternoon and will spend 8 days working with the Solympics team and local coaches. Already Fernandes has had several discussions with the Solomon Islands Football Federation (SIFF) technical department and the management of the Solympics squad. Fernandes says that during his stay in Honiara he will assist the Solympics team and the SIFF technical department with advice and work the team on some training sessions. “Basically, I am here to provide any assistance that is required by the local coaching team and those supporting them. I hope that I can supplement and enhance what they are already giving to the team. I also hope to assist local coaches with some training while I am here,” says Fernandes. SIFF general secretary, Eddie Ngava, said that SIFF is happy to receive someone of the status of Fernandes and he is sure that Solympics will be lifted by Fernandes’ support. “SIFF is pleased to welcome Fernandes and we feel privileged to have someone of his calibre with us. I am sure that a little of that Brazilian magic will be passed on to the players during his time working with them. This is very welcome support and I wish to thank Fernandes for making time in his busy schedule to travel to Solomon Islands,” Ngava said. SIFF’s technical department is calling on interested local coaches to contact them about Fernandes’ schedule so that they can attend some of the training sessions as observers. Fernandes is a highly qualified coach and currently the head of the football program at the Asia Pacific Football Academy (APFA) in Christchurch in New Zealand. APFA is a football and education institution where students from New Zealand undergo fulltime football training and is associated with the world famous Chelsea Football Club. His institution produced five (5) of the stars in the New Zealand U-17 team that took part in the FIFA U-17 World Cup in Mexico in 2011 and one of his top students , Cameron Howieson, recently signed up with English Division 2 club Burnley. Fernandes holds a US Soccer A-Licence certificate, the highest accreditation sanctioned by the United States Soccer Federation (USSF), as well as a US Soccer National Goalkeeping licence. 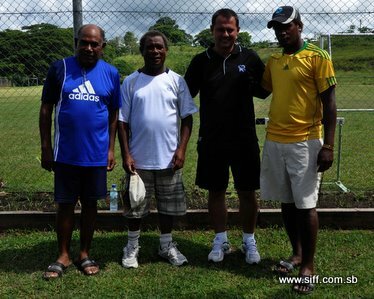 Fernandes travel to Solomon Islands is made possible by the OFC member association technical assistance program which is supporting national teams of its members by providing expertise through coaching and mentoring. Fernandes tour to Solomon Islands will end on Tuesday 6th March.